Cleaning products have become an indispensable part of our modern lives. They are used on a daily basis in nearly all workplaces and homes. In recent years, cleaning has been identified as an occupational risk, because of an increased incidence of asthma and asthma-like symptoms among cleaning workers [1–7]. Adverse effects on skin, such as occupational hand dermatitis, have also been reported by few studies of hospital cleaning workers [8, 9]. Results from epidemiological investigations support the hypothesis that exposure to cleaning products is related to the development and/or exacerbation of respiratory symptoms, including asthma [10–17]. The design of existing epidemiologic studies on cleaning has not allowed identification of agents responsible for asthma and other reported respiratory symptoms. This is related directly to the incomplete exposure assessment strategies carried out in these studies. Due to the lack of systematic occupational hygiene analyses and workplace exposure data, there is a need for systematic evaluation of cleaning products ingredients and their exposures in the workplace. We conducted interviews of cleaning workers and performed and observational surveys to identify the products used daily and the associated cleaning tasks. Material Safety Data Sheets (MSDSs) of the products were collected on site or obtained by the manufacturers' web sites. MSDSs of both the concentrated form and ready to use (RTU) form of all products were reviewed. The concentrated forms were evaluated even when only the RTU form was actually used in order to identify ingredients of the mixture with concentrations of less than 1% by weight, that are not reported from the MSDSs of RTU products. Information collected from MSDSs included hazardous ingredients as listed, their concentration in the mixture and chemical abstract services (CAS) numbers. Potential health effects of identified ingredients, together with their physical-chemical properties were researched through literature review and online search of Toxnet's Hazardous Substances Data Bank (HSDB) and ChemIDplus , the ACGIH 2008 TLVs and BEIs booklet , and the NIOSH pocket guide to chemical hazards . Applying the previously defined criteria, we prioritized ingredients among the large number of ingredient comprising cleaning mixtures. These ingredients were in the center of our further exposure assessment evaluation. The Dermal Exposure Assessment Method (DREAM), a validated semi-quantitative method for assessing dermal exposures, was applied to assess the potential for dermal exposure from common cleaning tasks [22–24]. The DREAM method is based on the conceptual model developed by Schneider that considers three major mechanisms by which the contaminant can contact the skin: emission, deposition and transfer. Emission is the transport of substances from primary sources to the skin in the form of vapors or particles that can happen through splashing and spilling, for example. Deposition is the transport from air to the skin and it is dependent on the deposition velocity, concentration of the chemical in air and area of the skin contact. Transfer is the transport of substances by direct contact with skin for example from contaminated working tools . Using these equations, we estimated the potential total body skin exposure per task (Skin-P TASK ) for a set of common cleaning tasks: toilet bowl cleaning, sink cleaning, mirror cleaning, floor cleaning with traditional method and floor cleaning with microfiber mops. 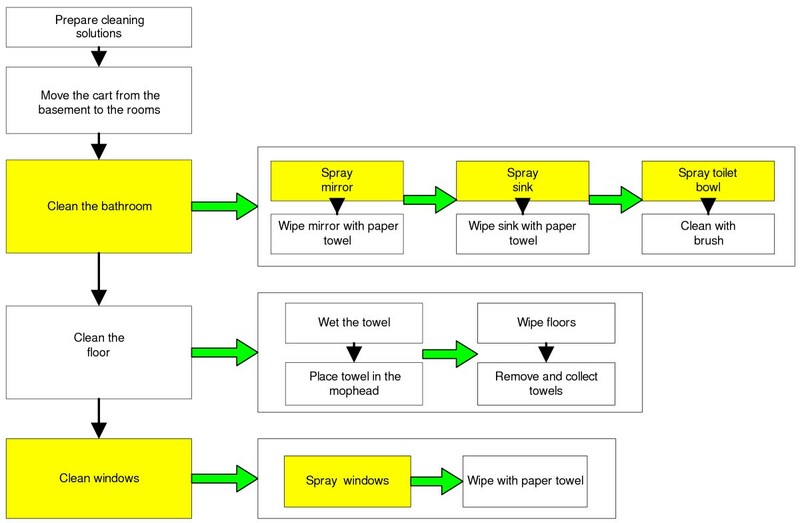 In the paper we present step by step estimations for two cleaning tasks. 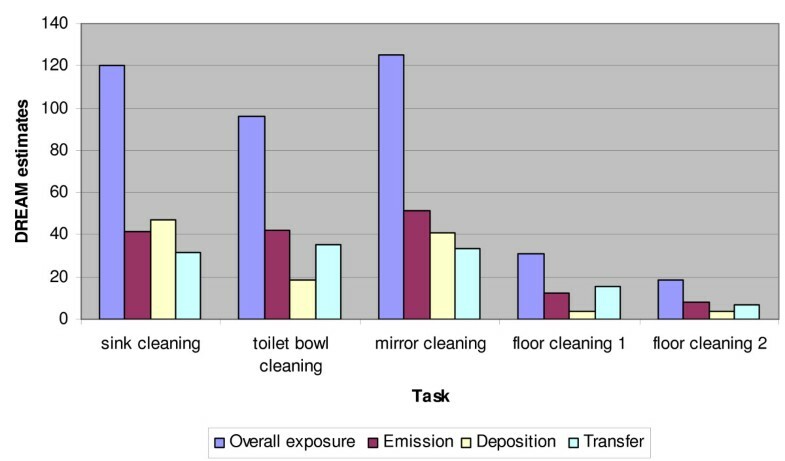 Based on the value of the Skin-P TASK , cleaning tasks were classified in different exposure categories as defined by DREAM: "no exposure", "low exposure", "moderate exposure", and "extremely high exposure". Additionally, body parts with the highest potential for dermal exposures were identified by comparing the DREAM estimates for different body parts. 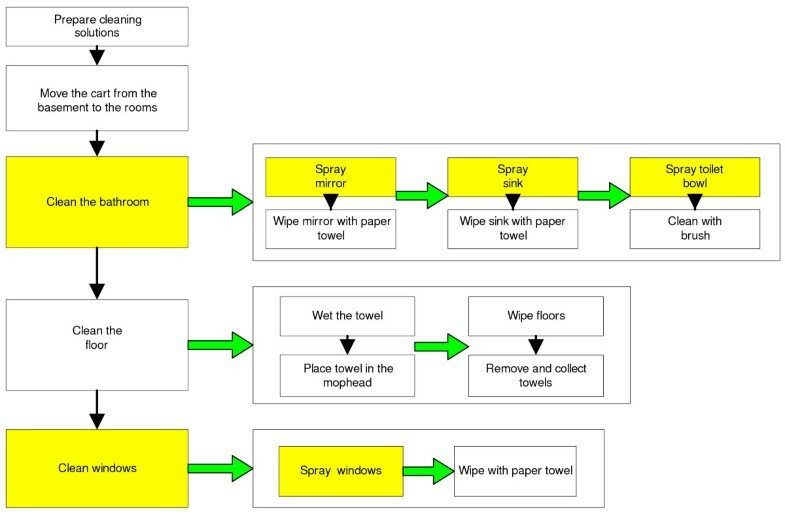 Process flow diagram of the tasks performed for patient room cleaning. The shaded boxes indicate cleaning tasks/steps with higher potential for inhalation exposure. Potential dermal exposure for five cleaning tasks. Contribution of emission deposition and transfer to the overall potential body exposure is shown in addition to the overall potential for the total body dermal exposure. Potential skin exposure for different body parts during different cleaning tasks. Floor cleaning 1 represents floor cleaning with microfiber mops and floor cleaning 2 represents floor cleaning with the traditional mop & bucket method. According to the DREAM categories, cleaning tasks create moderate (such as in floor cleaning tasks) and high potential for dermal exposure (such as in mirror/window cleaning, sink cleaning and toilet bowl cleaning tasks). We identified the relative contribution of three dermal exposure routes for different tasks as shown in Figure 2. As seen from this graph, the "emission" route contributes more to the overall exposure compared to "transfer" and "deposition" routes during mirror and toilet bowl cleaning. One possible explanation to this finding is related to the spraying activities that generate liquid particles with aerodynamic diameter >100 μm that potentially reach the skin. In the case of sink cleaning, the "emission" is lower because the potential for aerosol particles to reach the head and upper body parts here is lower compared to mirror and toilet bowl spraying. Transfer contributed more during floor cleaning, probably due to the continuous hand contact with the mop handle contaminated with cleaning solution. Overall, floor cleaning tasks were associated with the lowest potential for dermal exposures. Hands were identified as having the highest potential for dermal exposure for most of the tasks. 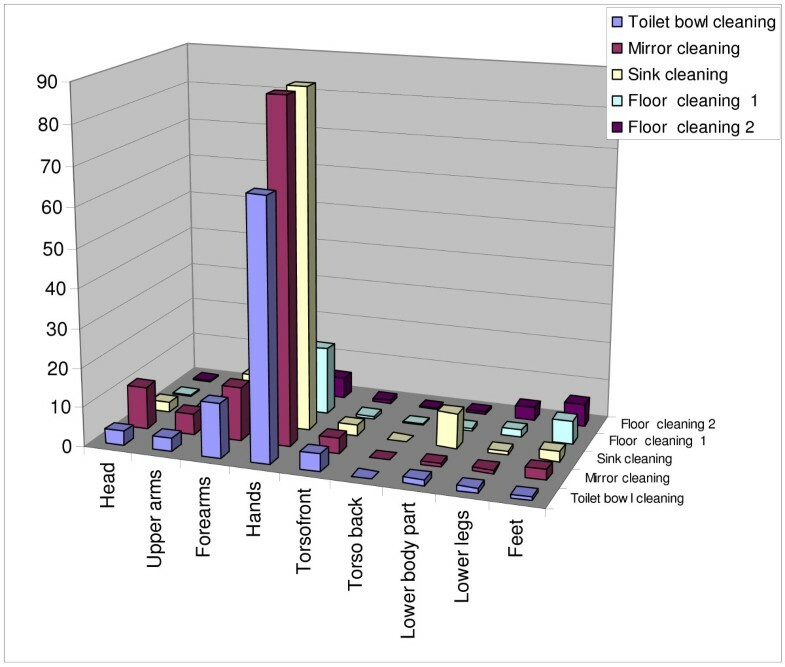 Forearms were at the next highest risk of exposure during sink, toilet bowl & mirror cleaning while for floor cleaning, feet and lower legs were most prone to exposure. The chemical ingredients identified in the products included disinfectants, surfactants, solvents, and fragrances. These ingredients are representative of different chemical classes such as ethers, alcohols, amines, acids and have a very wide range of volatilities and other chemical properties. The same chemical ingredients we have identified here have been previously reported by several studies [1, 26, 27]. One important finding is related to the high frequency of use of disinfectants among different product groups. Disinfectants are added to the cleaning products with the main goal to destroy microbial life. On the other hand, cleaning is done with the goal of mechanically removing the surface contaminants. An important question that can be raised is: Can disinfectants achieve their goal if they are applied in combination cleaner-disinfectant product? In order for disinfection to be effective, it should follow surface cleaning and the disinfectant should reside on the surface for about 10–15 minutes after application. In the case of combination product (cleaner-disinfectant) application, these procedures can not be followed. The effectiveness of disinfectants used for common cleaning activities has been questioned in the literature [29–31]. Although the evidence to date is minimal, repeated application of disinfectants may increase the risk of microbial resistance, which will require the use of stronger disinfectants in order to be destroyed [32, 33]. Given: 1) the uncertainty of disinfectant effectiveness in cleaning public areas, 2) the risk of inducing bacteria resistance, and 3) the health concerns related to the use of disinfectants, it is critical to further evaluate disinfectants' effectiveness for common cleaning activities and to develop workplace strategies for preventing workers from exposures to disinfectants. Such strategies may include purchasing of green cleaning products, identification of the areas where disinfection is needed, and following the necessary disinfection procedures in the cases when disinfection is necessary. 2-Butoxyethanol (2-BE), a glycol ether with boiling point (BP) of 168°C, was commonly used in cleaning products including glass/window cleaners, carpet cleaners and other surface cleaners. Indoor exposures to its vapors at a concentration threshold of 2 ppm (10 mg/m3) and above may result in sensory irritation . The OSHA permissible exposure limit (PEL) is 50 ppm for 8 h time weighed average (TWA), the ACGIH threshold limit value (TLV) is 20 ppm (8 h TWA) and the NIOSH recommended exposures limit (REL) is 5 ppm (10 hour exposure). There is a skin designation for 2-BE from both OSHA and NIOSH, indicating that 2-BE can be absorbed through the skin. The presence of 2-BE in cleaning products has been reported by several studies [35, 36]. Concentrations of 2-BE in the air generated during window cleaning reported by Vincent 1993 ranges from 0.1–7.33 ppm, lower than existing occupational standards. The study suggested that dermal exposure may be the most important exposure route in the workplace. Because 2-BE was one of the most frequent solvents in our products and had the highest concentrations in the bulk products, it is important to further assess its workplace exposures. Quantitative workplace investigations are necessary to measure the degree of exposure intensity and relationship with irritation symptoms reported among cleaning workers. Quaternary ammonium compounds, or quats, were widely used in many of the products investigated. Quats have been identified by Nielsen 2007 as one of the indoor agents that may promote development of airway allergy. In his review, Nielsen summarizes the evidence from animal and humans studies that relates quats exposures with allergy-promoting effects. He concludes that the mechanism of asthma from quats remains unknown. One important consideration in the investigation of asthma symptoms from quats is the understanding of exposure routes in the workplace. Although several case reports identify an asthma-quats exposure relationship, they lack the clarification on how exposure had occurred [2, 5, 6]. In the second case report of a study by Purohit 2000, the nurse developed symptoms after entering the room that was cleaned with a surface cleaning product that contained benzalkonium chloride. Because the nurse was not involved in cleaning activities the most probable exposure route would be inhalation and not through skin. A study by Vincent 2006 showed non-detectable levels of quats in the hospital indoor air . Inhalation to quats may happen in two ways: 1) by inhaling aerosolized liquid particles generated during product application, or 2) by inhaling quats absorbed into the dust particles that are re-suspended in the air. Further quantitative workplace investigations of inhalation and dermal exposures will provide important evidence for understanding actual exposure routes for quats. Fragrances were used commonly in bathroom cleaners. Exposure to fragrances is a topic of special interest because they may cause secondary emissions due to reactions of the primary exposures with oxidizers present in indoor air (e.g. terpenes, a family of chemicals common in fragrances, reacting with ozone in indoor air) . These reactions can produce secondary gaseous and aerosol ultrafine particles that may be responsible for the airway irritation symptoms [40, 41]. Very recently, Wolkoff (2008) found that gaseous products generated from ozone-limonene reactions are causative of acute irritation effects measured in a mice bioassay. Another important consideration related to fragrance use in cleaning products is the presence of odor during and after cleaning. Even at low concentrations, the presence of compounds with low odor thresholds may cause perceived respiratory irritation because of odor annoyance. Furthermore, this is a topic of special interest due to the reported sensitization effects associated with the fragrance use . Surprisingly, bleach was not used in any of these products compared to findings from other studies, which found that bleach can be responsible for asthma symptoms among domestic cleaners [14, 44]. Hazardous exposures related to cleaning products are an important public health concern because these exposures impact not only cleaning workers, but also other occupants in the building. Data from laboratory studies indicate a two phase decay of the air concentrations in the room. The first phase decay happens very fast (in the first 10 minutes) and the second phase decay happens slowly (about 1–2 hours for the air concentrations to reach the background level). Furthermore, experimental studies have shown that some compounds such as glycol ethers are released slowly from the surfaces. This creates potential for exposure of other occupants in the building, hours after the cleaning activities are performed [35, 36]. The intensity of exposures after the completion of cleaning has not been investigated in field studies. In a follow up study we will conduct quantitative assessment airborne exposures during cleaning and will provide evidence on the exposure levels after cleaning.